Join us each or any Sunday for a time of worship, friendship, and fellowship. Come early to have coffee, tea or juice, and mingle with us in our large open Narthex. Find a comfortable seat in our Sanctuary, with bulletin (and coffee) in hand. Participate in the service, with prayers and hymns projected on two large screens, or just watch and listen, if that is your preference. If you wish, drop by our audio/visual booth and borrow a headset or earbud to let you hear the service better. We are all family here and dress as we please, knowing it’s not what we wear, it’s who we are that is important. Know that you are always welcome! The church service is recorded on CD each week, with the past 2 months available for loan at our A/V booth. The Holy Elements are shared with all in attendance, of all ages. Always a special time for families, our Sunday School children lead us in our Annual White Gift service. Each Sunday in December we enjoy a few minutes of Christmas Carols before the formal service starts. A special time for all, a series of special services lead us towards that holiest of days, Easter. Our minister shares his spirit with families on each step of their life journey, enriching the traditional services to meet their needs. Contact the church office to make inquiries and arrange to meet our minister. 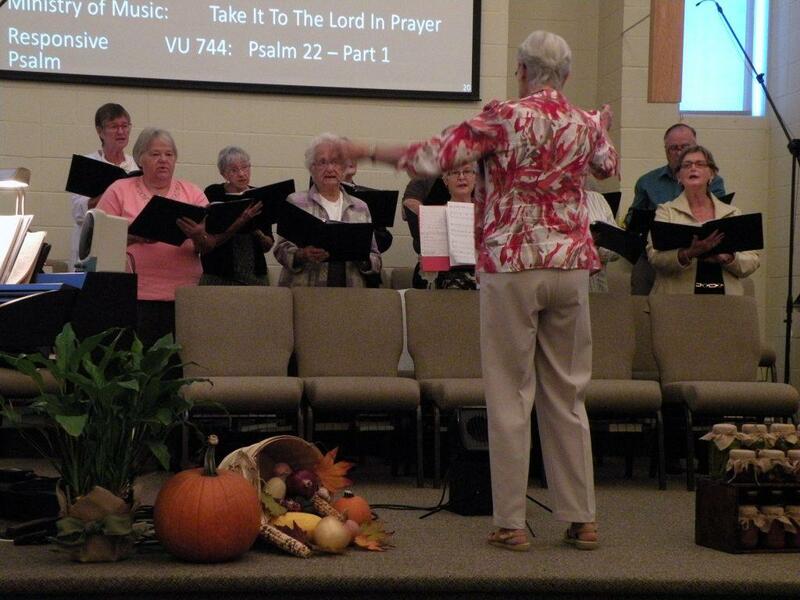 The choir of 12 or so members leads our congregation in song each Sunday. They often perform a Cantata at Christmas time, with many congregation members swelling their ranks for this special presentation. They practice Thursday evenings from 7 to 9 PM except during the summer months. New members always welcomed – please join us! Children join the minister for Children’s Time during the early part of church service, enchanting the congregation with “wisdom beyond their years”. They assist with the monthly Food Bank Sunday and Coins For The Sanctuary collections, encouraging everyone to contribute to these efforts. The kids and teachers continue their services in our four Sunday School rooms. They rejoin the congregation for Communion Sundays. Our nursery is available for infants and up to 3-year-olds, and is equipped with toys, books, “quiet room”, change table & washroom, and staffed by one of our volunteers. Parents wishing to stay with their infant can still hear the service while in the nursery.